The Teradek Cube 255 HDMI Encoder with WiFi sends 1080p HD video and encoded audio from a camera to the Web in real-time. It attaches right on top of a camera by an included hot shoe adapter or via HDMI cable. You can also store your files to a MicroSD card (card not included) with support up to 32GB. An OLED screen displays battery life, online status, and the URL it is streaming to. 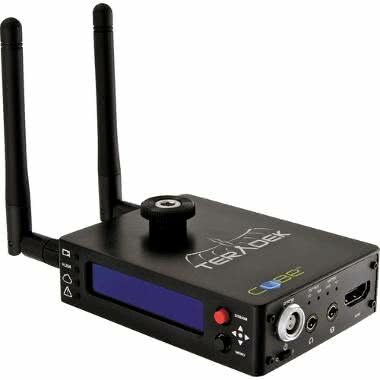 The Teradek Cube is ideal for showing real-time project progress to remote clients, recording family events, school announcements, and for live performances. • This encoder streams via WiFi and ethernet (cable included). It can also stream via 3G/4G USB modem (NOT included). • For local monitoring in Master Mode or Shared Access Point, download TERACENTRAL on your computer or mobile device.